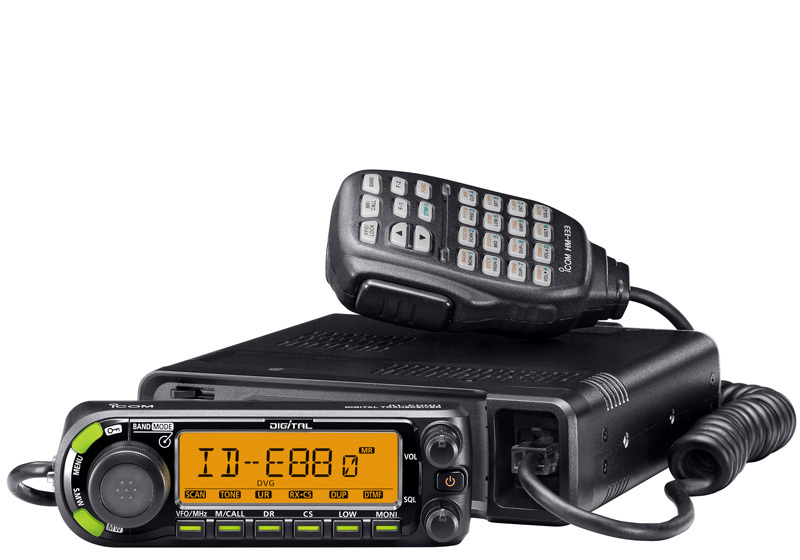 Icom is pleased to announce the debut of the ID-E880 mobile VHF/UHF dualband, D-Star transceiver. The ID-E880 is designed to be easy to use and contain a new 'DV mode' feature which allows the operator to access D-Star repeaters in just two steps. 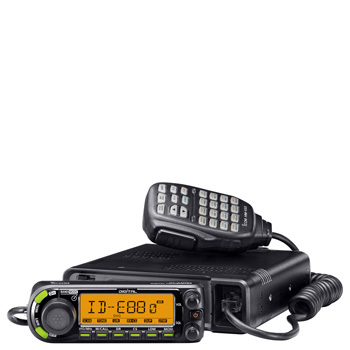 The ID-E880 mobile is the successor to the ID-800H mobile transceiver and retains many of the features of its predecessor including switchable dualband capability, detachable controller and 50W power output. The usability of the ID-E880 has been improved with a larger LCD display and a high speed scan capability of up to 50 channels a second. The ID-E880 is ideal for a range of users including foundation licencees, anyone new to D-Star and Ham organisations such as Raynet that are looking for a simple GPS position reporting system. The ID-E880 is compatible with the JARL D-STAR* format and provide DV mode operation with an AMBE® codec. 950bps (approx.) slow data can be sent simultaneously with the digital voice transmission. The ID-E880 can store up to 300 channels/callsigns in the repeater list. Each channel memorizes a repeater frequency, duplex direction, offset frequency, callsign, gateway callsign and RPT1 (Repeater 1) use setting. The RPT1 use setting is a convenient function to flag an often used uplink D-STAR repeater to access. The access repeater scan finds an available D-STAR repeater from the RPT1 use repeater. The new DR (D-STAR repeater) mode operation makes it easier to access a D-STAR repeater. When GW (gateway) set is set to “Auto”, it only takes two steps to access the repeater. When connected to an external GPS receiver or GPS speaker-microphone the ID-E880 shows position data on the display and own and other station’s position information can be sent and received *. The ID-E880 can send the position data either by holding the PTT switch, or at a preset interval (5 seconds–30 minutes), depending on the setting. In addition, the GPS A mode assists in easy D-PRS mode operation, to send your position information to an APRS server from the D-STAR radio. * GPS data receive only is possible when no external GPS receiver or GPS speaker-microphone is attached. When connected to a PC* via the optional RS-232C cable, the position information can be plotted on mapping software* on a PC. * Serial port and position mapping software (NMEA 0183 format) are required. The ID-E880 provides VHF/UHF dual band capabilities (one band at a time) via a simple band switching system. The ID-E880 series covers 118–173.995, 230–549.995 and 810–999.990MHz. *Receiver range depending on versions. See specification page. CS-80/880 cloning software is free to download from the Icom Inc. web site Used with this software, various settings can be made from a PC and the memory channels and other settings can be shared between IC-E80D and ID-E880. * Either OPC-1529R, OPC-478 or OPC-478UC optional cable is required. The ID-E880 has a total 1052 memory channels (including 1000 regular channels, 50 scan edges and 2 call channels) with 26 memory banks. All memory channels and program scan can be named with 8-character channel comments. A memory bank can be named with a 6-character bank name comment. The ID-E880 supports various scan types for maximum reception and ease of use. Monitor function to listen to a weak signal. The main controller is separate from the main unit to allow flexible installation. The main controller has magnets on the rear panel which allows it to attach to the main unit or other metal objects. The ID-E880 has a compact body and a 64 x 20.7 mm large LCD display. The backlight color of the display is selectable from green, yellow and amber for your visual enjoyment. A MOS-FET power amplifier provides a powerful 50W* both in the 144MHz and the 430(440) MHz bands. Output power is selectable in 3 steps. The ID-E880 has a Max. 50 channel/sec. high speed scan capability in program scan mode (Max. 20 channels/ sec. in memory scan mode). This scanning power allows the utmost efficiency when searching a wide frequency range. The built-in noise filter reduces high pitch noise for AM and FM mode reception. The noise filter width is selectable from wide, middle and narrow. The auto setting allows you to select the filter width according to the signal strength.